This little santa turned out pretty good. The card base is 11 x 5 1/2. 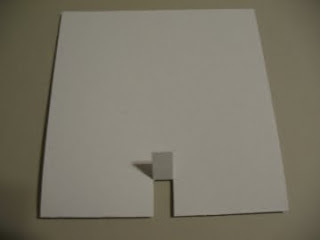 When you do a pop up card, be sure to take into account the extra card height you need when the card is closed (for cards that have large pieces inside like this one). 2) Punch out 1 3/8" circle in blush blossom, 2 half inch circles in blush blossom, 2 quarter inch circles in blush. Trim one of the 1/2" circles to make an oval for nose. Sponge the edges of all pieces with pink pirouette. 3) punch out 2 scallop circles in white. Cut one in half for beard. 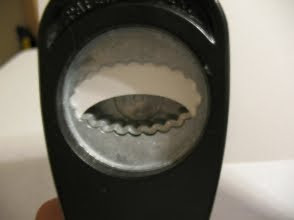 Use 1/2" circle punch to punch out a small amount for mouth (see picture). Cut 2 petals off of the 6 point flower for mustache. 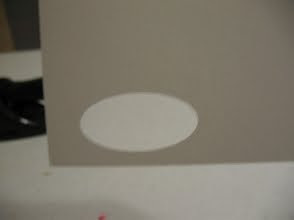 4) Glue 1 3/8" circle centered onto scallop circle. Use pop up dot to attach nose, glue on eyes, ears, mustache and beard. 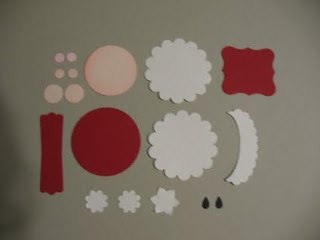 Add a couple 1/4" circles (pink pirouette) for the cheeks. Use the uni-ball white gell pen for highlighting the eyes, nose and cheeks. 5) Glue 1/2" blush circle on end of modern label for hand. Cut small boho blossom in half and layer onto cuff. 6) Glue hat on head, beard on face and head on body. Punch 2 more modern labels in red for legs and 2 wide hearts in black for feet. 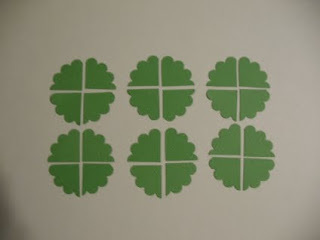 7) Punch 6 to 8 scallop circles in garden green. Quarter each circle. Layer the pieces to make the tree. Punch 1/4" circles in mustard and red for ornaments, star in mustard. Punch trunk with word window in chocolate chip. Cut bottom off to make a flat bottom. 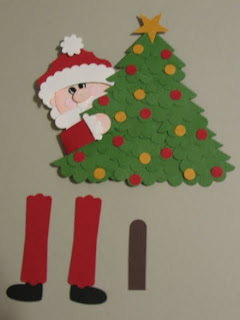 8) position santa behind tree. Glue on legs and arm. Fold arm over and tack in place. 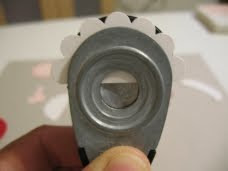 10) Fold clipped piece up and sharpen crease. 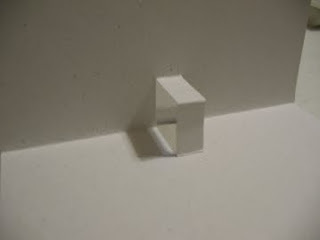 Open card and pop tab inward. Attach santa to tab. These instructions are a less detailed than what I normally give in my paid-for classes. I just threw this one together tonight. Enjoy! 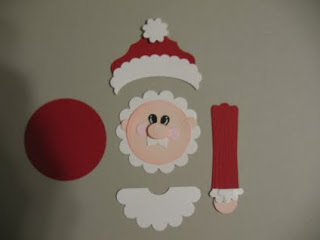 If you recreate my santa and post on your blog, please post a link to my site for the instructions. 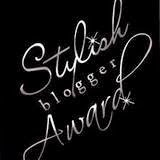 Please do not recreate or post step by step instructions on your website, blog or video (youtube). Thank you. 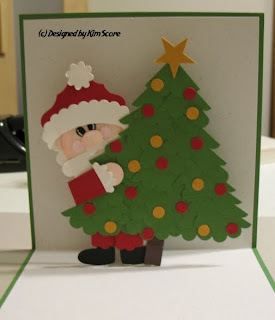 Your Santa/Tree pop up card is very cute. I just purchased your Christmas punch kit. I would like to sign-up to get your updates, but I couldn't find where to do that. Am I missing it. What a fantastic tutorial! 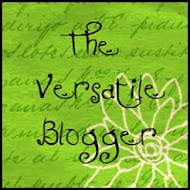 A friend of mine just sent me the link to your page and I'm bookmarkin' it! So cute! You are so clever. I just love his cute face. Great job! This is beyond brilliant!! Love it - thanks for the instructions. Saved it for future reference/use. 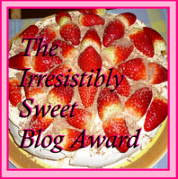 Oh, my word...that is WONDERFUL!!! 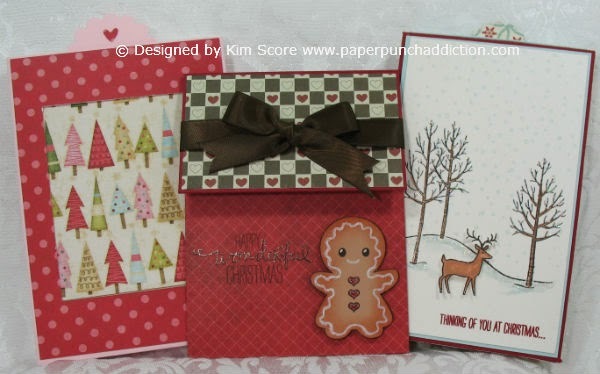 i have already purchased your holiday punch instructions..very cute..and of course clever..looking forward to seeing more of your creations..
Kim, this is darling!! 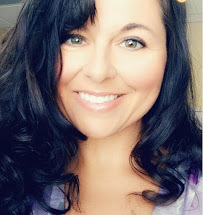 Thank you so much for sharing your talent! You do a great job with punches! thanks for sharing your art! This card is so clever and cute! Thanks for the tutorial. I love the idea! Thank you for sharing. 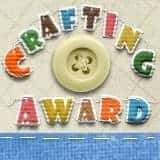 This is an adorable project and your detailed instructions and photos make it easy to follow. Fantastic job! Espectacular ,hermoso y facil .además se puede hacer con cualquier época .